Today is the tenth anniversary of the attacks on 9/11. As a small tribute, here’s a photo taken on that very day by freelance photographer, Doug Kanter. 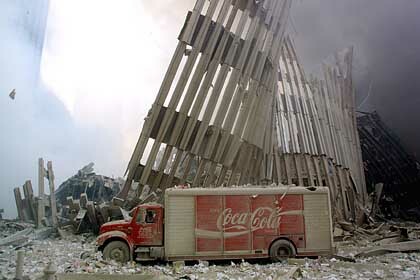 This image is of a Coke truck that sat among the rubble after the collapse of the first World Trade Center Tower. That day, I had just begun my sophomore year at Marymount Manhattan College. My poetry class started at 8:30am. For the next hour and a half, we were oblivious as to what was happening with the rest of the world. Not until the bell rang and left class, did we get details of the attacks. The school remained opened but classes were suspended for the rest of the day. I called home letting my family know that I was ok. However, there was no way for me to get back to New Jersey. I had to walk for miles (in high heels) to get to Penn Station. Although the streets were desolate, the people of New York remained calm. I wasn’t able to leave the city until later in the evening when the first train out of New York was to Newark, NJ. But from that day forward, I would never forget the images I saw on September 11. So here’s to New York, the country and all the heroes that changed our lives.